Dubai: Drone hexacopters will soon hover above construction sites and labour camps, ensuring that labour companies are complying with regulations set by the Ministry of Labour. 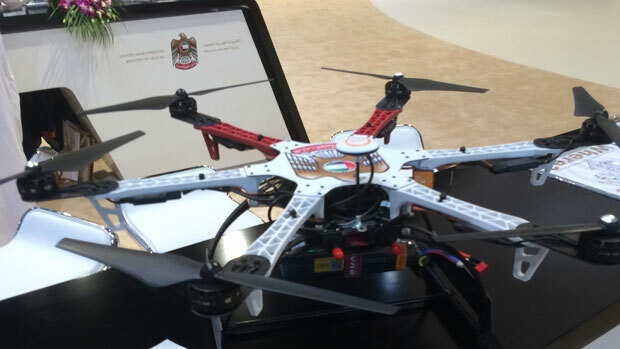 The remote-controlled hexacopter was revealed at the ministry’s stand at the GITEX exhibition. It can be controlled within a 2km radius and features six rotary blades and a Go Pro camera. The copters will also be used to determine if labour companies are following the mid-day break regulations. The rule forces companies to give a mid-day break to outdoor workers from June 15 to September 15. “With this drone copter we can investigate construction sites and ensure that companies are following the directive by giving their outdoor employees a mid-day break during peak summer,” the official said. The ministry revealed last month that only 15 companies were found violating the rule this year. “The copter will also be used throughout the year to ensure that companies are following the ministry’s health and safety standards,” he said. “The copter’s camera records everything. If a company denies violating safety standards we can simply extract the video file from the SD card and present it as proof,” he said. The copter was built in cooperation with the Higher Colleges of Technology in Dubai. The official said that although the ministry only has one drone copter now, more will be built. “We will be signing a memorandum of understanding with the Higher Colleges of Technology on Wednesday, here at GITEX,” the official said. The ministry’s stand at the GITEX exhibition is also issuing ‘Absher’ cards for UAE citizens working in the private sector. Salem Al Mutawa, Deputy Director of Absher office at the ministry, said that the ministry prints Absher cards instantly to those who meet the conditions required by the ministry. The card provides privileges and special discounts in order to motivate citizens to join the private sector. Citizens working in the private sector can register for the initiative by simply clicking on the ‘Absher’ link on the ministry’s website www.mol.gov.ae.